I like to imagine that I am open to new ideas, suggestions, hypotheses and such, although I must admit at the same time that I am not overly keen to listen to foolish notions without logical backup. So it happens that some months back I hosted Peter Hayes, from Tasmania. Peter was in South Africa conducting clinics, mostly focused on fly casting. But then Peter is a man of unrivalled enthusiasm when it comes to fly fishing and he will pretty much discuss anything remotely related to the sport. Getting Peter to offer up some gem related to anything piscatorial is about as tough as getting an alcoholic to have “one for the road”. He is as said, enthusiastic but equally thoughtful and he isn’t overly likely to put forward an idea that he hasn’t, in his own head, considered carefully. Peter has more tricks up his sleeve than a bone fide member of the magic circle and when he is prepared to take a bet that “his knot” is better than “your knot” you are best off to keep your money in your pocket and listen carefully. That then was how I was introduced to something Peter refers to as “The Penny Knot” after the person that showed it to him. I suspect that the knot might well appear in other places under various pseudonyms but that doesn’t make it any less practical. 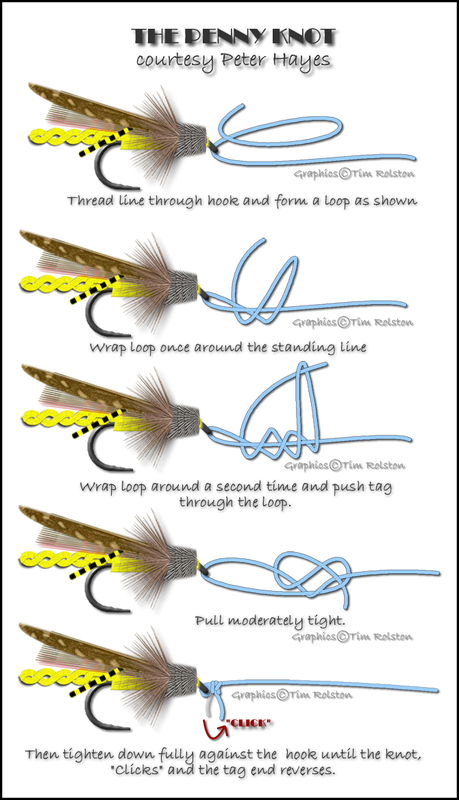 According to Peter the knot for tying a fly (or hook if there are some lowly bait anglers reading this) to the nylon, maintains 100% of the strength of the monofilament. That is some boast, I would have told you an impossible one to be honest. So we had “knot fights” the battle of one connection over the other, Peter didn’t lose, and so I had to revise my opinion. I have used a “Duncan Loop Knot” for years to affix my fly to the tippet, I use a lot of very fine nylon and have become quite fussy about knots in general. It took some persuasion to change and not an inconsiderable amount of retraining. I have probably tied well over a million “Duncan Loop Knots” in my life so was more than proficient at it. Now I had to practise, create new muscle memory so that I might take full advantage of a different attachment. All I can tell you is that it was worth it, this simple and extremely small knot works well even in fine nylon and since converting I don’t think that I have broken off a fly in a fish, not once. Actually I haven’t broken off many in the trees either, the herbage seems to give way before the knot does much of the time. Here is the knot as shown to me by Peter, you best learn it and use it, after some four decades of fishing and tying knots I haven’t ever come across one as reliable as this, actually not even close. There are lots of other useful tricks in a variety of books by the author of this blog available from Smashwords and Inkwazi Flyfishing.